Conserved DNA-binding domain that is found in a wide range of proteins of large bacterial and eukaryotic DNA viruses. 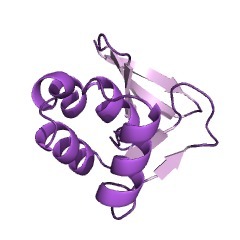 Bacteriophage P1 protein kilA (P19653). Fowlpox virus (FPV) protein FPV236 (P14365). Trichomonas vaginalis G3 Putative uncharacterised protein (A2D8C0). 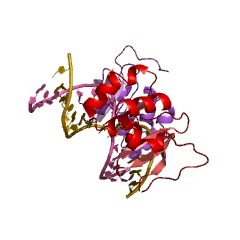 Vaccinia virus hypothetical 21.7 kDa HindIII-C protein (P17366). There are 6304 KilA-N domains in 6296 proteins in SMART's nrdb database. Taxonomic distribution of proteins containing KilA-N domain. This tree includes only several representative species. The complete taxonomic breakdown of all proteins with KilA-N domain is also avaliable. Click on the protein counts, or double click on taxonomic names to display all proteins containing KilA-N domain in the selected taxonomic class. Extensive domain shuffling in transcription regulators of DNA viruses andimplications for the origin of fungal APSES transcription factors. 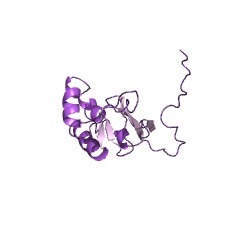 BACKGROUND: Viral DNA-binding proteins have served as good models to studythe biochemistry of transcription regulation and chromatin dynamics.Computational analysis of viral DNA-binding regulatory proteins andidentification of their previously undetected homologs encoded by cellulargenomes might lead to a better understanding of their function andevolution in both viral and cellular systems. RESULTS: The phyletic rangeand the conserved DNA-binding domains of the viral regulatory proteins ofthe poxvirus D6R/N1R and baculoviral Bro protein families have not beenpreviously defined. Using computational analysis, we show that theamino-terminal module of the D6R/N1R proteins defines a novel, conservedDNA-binding domain (the KilA-N domain) that is found in a wide range ofproteins of large bacterial and eukaryotic DNA viruses. The KilA-N domainis suggested to be homologous to the fungal DNA-binding APSES domain. Weprovide evidence for the KilA-N and APSES domains sharing a common foldwith the nucleic acid-binding modules of the LAGLIDADG nucleases and theamino-terminal domains of the tRNA endonuclease. 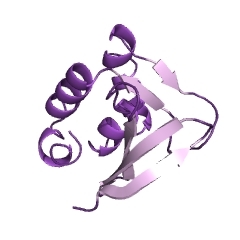 The amino-terminal moduleof the Bro proteins is another, distinct DNA-binding domain (the Bro-Ndomain) that is present in proteins whose domain architectures parallelthose of the KilA-N domain-containing proteins. A detailed analysis of theKilA-N and Bro-N domains and the associated domains points to extensivedomain shuffling and lineage-specific gene family expansion within DNAvirus genomes. CONCLUSIONS: We define a large class of novel viralDNA-binding proteins and their cellular homologs and identify their domainarchitectures. On the basis of phyletic pattern analysis we presentevidence for a probable viral origin of the fungus-specific cell-cycleregulatory transcription factors containing the APSES DNA-binding domain.We also demonstrate the extensive role of lineage-specific gene expansionand domain shuffling, within a limited set of approximately 24 domains, inthe generation of the diversity of virus-specific regulatory proteins.